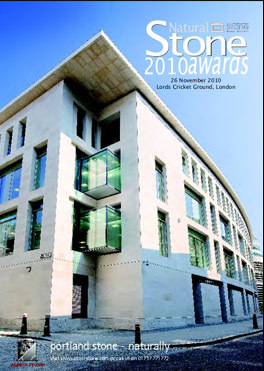 This brochure of the Stone Federation Great Britain's 2010 Natural Stone Awards commemorates and presents those projects that the team of distinguished architects who form the judging panel have selected for recognition. The winning projects have been chosen for the exemplary design and execution of the stonework. The clients, architects, main contractors, specialist are all recognised for their essential contributions to the successful projects.